Watch the Free 15 Minute Recording of Our Webinar! The first step to any good market research project is getting good data. And to get good data, you need to make sure you are recruiting the right market research respondents. If you have done qualitative or quantitative research for any period of time, you know that this is can be more difficult than it would seem. 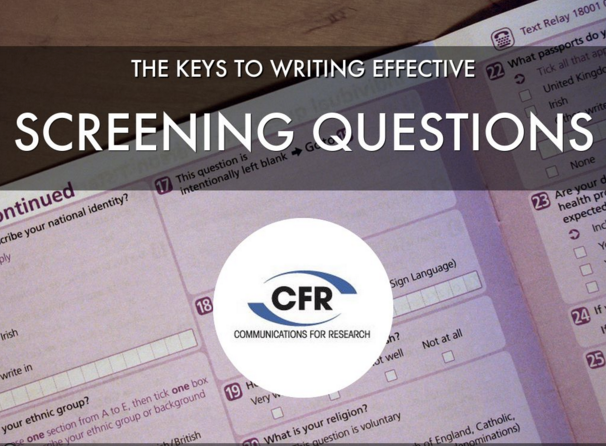 In this 30-minute webinar, CFR's Colson Steber will show you the best practices you should follow to craft the best possible screening questions..
How to structure your answer choices to save you time on re-screening. Colson Steber has built a reputation as a trusted advisor who helps navigate complex and ambiguous research situations. As CFR’s vice-president for business development, he develops relationships with current and prospective customers through direct involvement in research projects. Colson joined CFR in 2012.